Nottingham Outlaws travelled up to West Yorkshire to face an unbeaten Batley Boys outfit that were currently topping the league with a 100% win record. 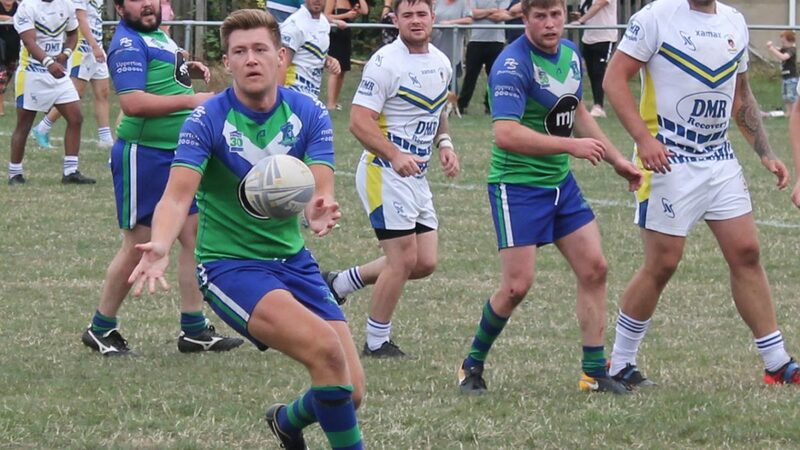 Despite having top four ambitions of their own, the Outlaws were no match for the runaway league leaders who ran in twelve tries on their way to recording an emphatic 64-6 victory. The Outlaws went into the game with a number of changes to the side that lost at home to Bentley under the floodlights at Lenton Lenton Lane last week. Andy Musvaburi came into the centres to partner Joe Harrison Brown on the left hand side of the three quarters whilst Alex Wright and Jack Elliot came back into a re-shuffled pack. There were changes on the bench too as Sam Andrews returned to the side after a lengthy absence and Aiden Foster was rewarded for a fine season in the Academy with a well earned first team debut. Any hope that the travelling Outlaws supporters might have had of an upset quickly evaporated in the opening set when Batley moved the ball wide and they immediately found the overlap to register a try on only the third tackle of the game. The Outlaws were clearly up against it and the Batley lead soon extended to 18-0 with another two quick-fire scores, effectively putting the game to bed with only 10 minutes on the clock! Playing Batley Boys was always going to be a tough proposition, but with the help of a pronounced slope and with confidence sky high the Outlaws could do little to stop the home team extending their lead at will. Indeed, with some fine handling and great choice of attacking options the travelling supporters could only look on with admiration at a home side that was giving a great demonstration of attacking rugby league football to all watching. As the first half progressed the Outlaws could do little to stem the flow of try’s against them. And to make matters worse they were being effectively starved of possession, hardly seeing the ball and with it any chance to break out of their siege. By contrast the home side dominated possession, moving the ball back and forwards across the pitch at a pace that was too hot for the Outlaws to handle. As a result as the score board continued to click over with alarming regularity. Thankfully the first half eventually came to a close with the home side registering seven try’s to nil and the scoreboard recording a 38-0 score line in favour of the rampant league leaders! If the Outlaws were to make any sort of impression in the second stanza the first thing they needed was some ball, having had only eight sets of possession in the first half. However, on the opening set of the second half they gave away a penalty in possession that Batley ruthlessly punished to extend the home lead to 42-0. Despite the early set back the Outlaws began to advance the football with the aid of the slope and a fine surge by James Hood took play deep into the Bentley forty for what seemed like the first time in the game. There seemed little on when Andy Musvaburi picked up the ball in midfield but the big centre used his size and the slope to smash his way through the home line for a fine solo effort that pegged the home lead back to 42-6. With the slope in their favour and with a more even share of possession the the Outlaws were putting up a much better show than they did in the first stanza. Indeed forwards Ephraim, Wright and Andrews were starting to make good yardage down the middle whilst some fine cover tackling by man of the match Oliver Dale kept the home forwards at bay. With a better platform to work on the Outlaws at last began to ask a few questions of the home defence and Andrews almost doubled the Outlaws tally but he was held up over the line. Despite the better second half showing, the Outlaws could not add to their lead and as the match entered the last quarter they began to tire and with it came more home try’s. Once again the slick moving Batley side began to attack from all angles, exposing some tired Outlaws defence in the process as they crossed the whitewash four more times to register a heavy 64-6 defeat on the Outlaws. Despite the defeat the Outlaws had battled well against a side that has dominated the division from the get-go. However more important games lie ahead for the Nottingham outfit, with two home games coming up that will decide whether they will make the top four play-offs for the first time, starting with a must-win home game against Siddal next week!